The Barrons Factory that was located in Wood Street on a site occupied by the "Coffee Club" in 2005. 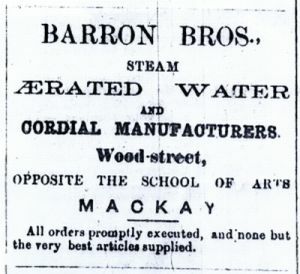 Edmund Barron came to Mackay and opened one of the first Aerated Water Manufacturing business’ in Mackay in 1869. Michael Barron was born in 1851 in Ireland and came to Australia in 1873. Landing in Brisbane he went to Warwick were he was a farmer for four years before moving to Cooktown where he learnt the business of cordial making. 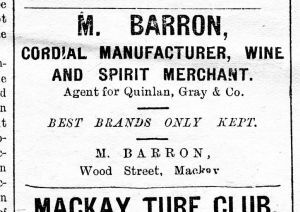 Michael Barron then came to Mackay and went in partnership with his brother and appeared to have taken over the Barron Bros. business in 1881. Edmund then appears to have established another business in Gregory Street on a site now occupied by the St. Patrick’s College. This was later sold to James Comerford. 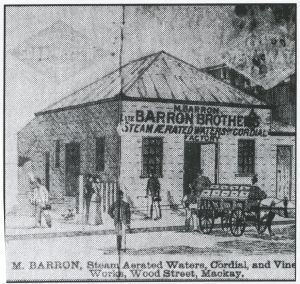 In 1883 Michael Barron acquired steam machinery and modern appliances for bottling the drinks. He also imported his bottles directly from England. The factory was managed by Mr. W.F. Byrne who was regarded as a pioneer cordial manufacturer of the district. He had previously managed McCluskey's cordial factory. The original Barron Brothers cordial factory was located in Wood Street on a site that is now occupied by a group of shops built after the Batros building was destroyed by fire in 2001. Michael Barron died on August 22, 1909 and is buried in the Old Mackay Cemetery. His business continued under the management of his son Michael Jnr. until it was taken over by the Roberts Brothers around 1922. It was in turn taken over by Harrup Brothers in 1931. Mengler, Vyvian (2000), James Perry Remembers Mackay, A collection of articles written by James Perry, Albany, W.A. : Vyvian Mengler. The Daily Mercury, Monday, August 23, 1909. The Daily Mercury, Monday, April 1, 1996. 130 years of printed history supplement. 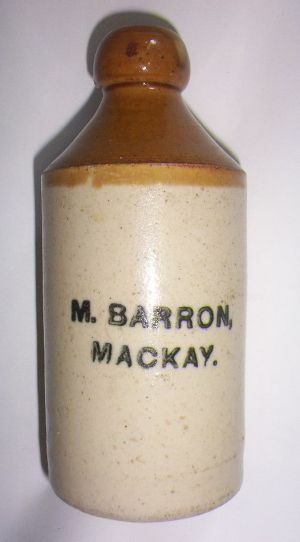 Barron's Marble Bottle. 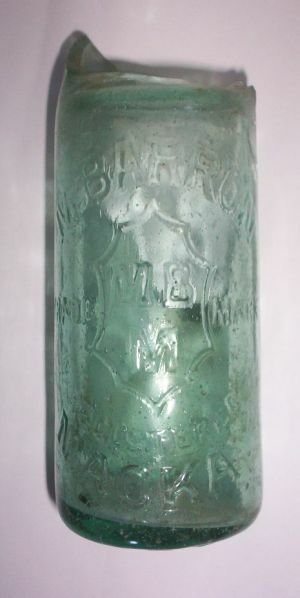 Another style of shield on this broken Barron's marble bottle. Another example of a broken Barron's marble bottle. Barron's Blob Top Stone Ginger Beer bottle. An example of a Barron brothers Blob top. Mackay Mercury, 25 February 1885. Michael Barron advertisement. Mackay Mercury, 1 April 1905.